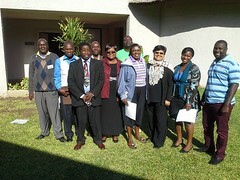 Zimbabwe Library Association (ZimLA) National Information Policy Working group met in Gweru over the weekend on 18th June 2016 as a follow up meeting to the workshop that was held in Harare at Cresta Lodge from 5 - 6 May 2016. The follow up meeting was meant to chart the way forward with regard to the crafting of a National Information Policy (NIP). The working group was tasked to either steer the possibilities of influencing inclusion of NIP as a section in the National Information and Communications Technology Policy currently under review or coming up with a standalone National Information Policy. ZimLA Advocacy Officer, Mr. Jasper Lee Maenzanise, took the group through the various options citing the advantages and challenges involved in each phase of either adopting a standalone information policy or drafting a section to be included in the ICT policy. Throughout the deliberations the need for wider stakeholder involvement was cited as a major requirement in the formulation of the NIP which in itself is a time consuming but very necessary process whether as a contribution to the draft ICT Policy or as a standalone policy. Furthermore, it was agreed that the draft ICT policy had already carried out wide stakeholder consultations although the Library sector was omitted. The Working group also considered the possibility and implications of formulating a National Library Policy instead of a NIP. The Working group engaged in rigorous debate and analysis of advantages and disadvantages as well as the process mapping for the Library policy were outlined. This was eventually compared to the process mapping for a National Information policy. Having considered the two options, the Working group eventually agreed to formulate a National Library Policy which will cause the need for revising aspects of the draft ICT policy and include the Library elements that have been omitted during its formulation. During the process of unpacking and understanding the context in which Zimbabwe libraries exist through a detailed SWOT analysis, it was established that ZimLA was well positioned to drive the national library policy that would guide the development of libraries in Zimbabwe. 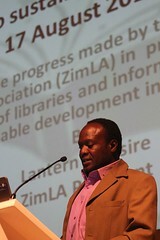 It was agreed that libraries in Zimbabwe have been operating and surviving in an environment that lacked policy guidance. Although various pieces of legislation exists that directly or indirectly impact on the management of libraries, there has not been any policy framework that guide library development. It was envisioned that a national library policy would open up avenues to strengthen the library sector in Zimbabwe and advocate for support from Government. It further helps to align the library sector with national developmental priorities as well as address the Africa Agenda 2016 and the UN global SDGs thereby putting the library profession in a strategic position to provide equal access to information for all and be effective agents of change. Using examples from Namibia, Zambia and Botswana, the ZimLA NIP Working Group was able to come up with a template for the National Library Policy that will be used to solicit inputs on the structure and elements of the policy before the policy is designed and developed. It was agreed to use the forthcoming ZimLA International Conference to solicit stakeholder buy in into the whole process. Working group members were tasked to work on the priority areas to be covered by the policy. A deadline of the first week of August 2016 was given for the NIP working group to come up with a draft of the National Library policy framework.